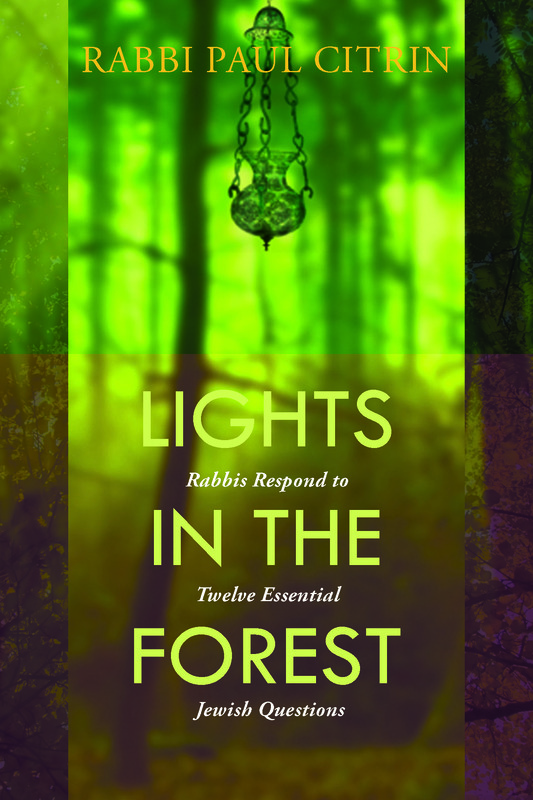 Introducing "Lights in the Forest"
In anticipation of the forthcoming publication of Lights in the Forest: Rabbis Respond to Twelve Essential Jewish Questions, CCAR rabbinic intern Andy Kahn interviewed editor Rabbi Paul Citrin. A volume that made a large impact on me was something published by the American Jewish Committee in the mid-60s called the Condition of Jewish Belief. It was a symposium compiled by editors of Commentary magazine where 38 rabbis from all of the streams of Judaism responded to five theological concerns. I found it to be tremendously interesting and helpful as an undergraduate student in Los Angeles. It recently dawned on me that there was nothing like that on the market today. I looked at 12 different publishers that produce Jewish books and there was nothing that came close to it, by which I mean a collection of essays by various contributors not targeted for either children or graduate students in philosophy. The questions in the book are stimulated by real questions that congregants ask their rabbis. I find that there is a core of Reform and Conservative Jews who want to be well-grounded in Jewish tradition. Their Jewish knowledge and identity is a central part of who they are, even if they don’t have all of the formal education they may desire. This volume will help strengthen that serious commitment. My hope was that such a volume would not only stimulate individuals, but that it would also be a resource for group study in synagogues and in learning communities. I can see it being used in synagogue-based adult education class or chavurah study groups, or in a Confirmation class of teens. This text is meant to be a goad towards wider discussion and deeper thought. It also doesn’t need to be read cover to cover in a few sittings. It can be read selectively and over time. Each essay can stand alone to a reader, while the whole collection together helps to provide a wide-range of perspectives on the deep theological issues present. Because of this it has broad appeal and is very accessible. Even people who do not necessarily consider themselves seekers may indeed find a light of curiosity or deeper interest turning on. I hope that this accessibility and flexibility will help to bring greater interest to our movement. We tried to find a wide and representative range of the rabbinate. It covers two generations of Reform Rabbis with people ordained 1974 all the way up to 2013. We strove for gender balance, and also for some geographical variety. We have one Israeli contributor, and one currently working in Hong Kong. There are contributors who are pulpit rabbis, Hillel rabbis, and academics. Although the language is meant to be easily accessible for the non-technical reader, we have a wide variety of writers who thought a lot about these questions. At the time I made this proposal I had been on the pulpit for 38 years. My experience as a congregational rabbi was that many Jews want something that is both an intelligent and a communicative discussion of key theological ideas from a liberal perspective. I think that clarity of theology helps to ground Jews in their connection to Judaism and the Jewish community. Theology is what yields values, and when we have values firmly rooted in our faith system we can take actions rooted in our theology and our values. Aside from the Condition of Jewish Belief as an inspiration, often I have used a little vignette spoken by Rabbi Israel of Rhyzin about two people entering a forest. One person had a lantern and one did not. The two meet, and the one carrying the lantern is able to illuminate the path of the one travelling in the dark. When they part company, one is left alone in the dark once again. Rabbi Israel of Rhyzin says that from this we learn that everyone must be able to carry his own light. My hope is that this book will provide light for people’s paths to provide a wider horizon of ideas and permission to enter this debate and discussion of what Jews believe, along with further study. About Lights in the Forest and the free downloadable discussion guide. Rabbi Paul J. Citrin was ordained by the Hebrew Union College– Jewish Institute of Religion in 1973. The focus of his rabbinate has al- ways been in congregational life. His passions are education, Israel and social justice. He is the author of a children’s novel, Joseph’s Wardrobe (UAHC 1987), Gates of Repentance for Young People (co-authored with Judith Abrams, CCAR, 2002), and Ten Sheaves (Create Space 2014). He serves the Taos Jewish Center on a monthly basis. Congratulations, Rabbi Paul Citrin, on your new book which I will be purchasing asap. Congratulations, Rabbi Paul Citrin, on your new book. And congratulations to our niece, Rabbi Suzanne Singer, on being included in this book. Ordered it two weeks ago and will teach from it this year. Congratulations Rabbi on your new book. I anxiously await its delivery to my door step. Your graciously invited me to dinner at your home and I attended during High Holidays back in 2001, in Palm Desert, CA. Just recently experienced a major break in my marriage, my husband had left and I was brand new to the area, having moved from Boston to the desert. Your generosity and kindness was such a huge salve to my injured self at the time. I will never forget how you made me feel, so very welcome and supported. Miraculously my husband and I have reunited after several estranged years, We’ve been living together for past five years. His health is greatly compromised but I am grateful for the moments that we have with one another. Blessings to you and thank you for lighting the way for others with your dear spirit as well as the precious time you have given to the world, in writing this book.